The book consists of 12 chapters which are followed by a Glossary and an Index. A Preface precedes the chapters. Undoubtedly, the safety of a road vehicle and persons moving in it depend on the effective and reliable design of vehicle braking system, which should decelerate the vehicle quickly and safely. Brake failures constituted 25% of all the crashes occurred on roads according to NMVCCS data (NHTSA, USA) in 2007. However, brake failure is costly and time consuming for car manufacturers. In April 2007, BMW recalled over 160,000 SUVs because of a problem that could cause a potential loss of brake fluid or even the brake circuit to fail completely. In May of the same year, Chrysler recalled 60,000 vehicles due to an issue with potential brake failure. If there is something wrong with the brakes, a grinding or squeaking noise would be heard when using the brake, or there would be difficulty in stopping the car and applying brakes would cause the vehicle to veer to one side. 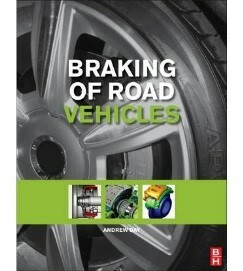 Starting with fundamental requirements of a braking system and providing theoretical background behind the various aspects of braking phenomenon, the present book is a complete treatise on braking of road vehicles and on the analysis and design of braking systems of these vehicles. The author has been the Director of Braking of Road Vehicles course of Bradford University and has extensively researched in the area. The book is based on the papers published by him and his mentors Peter Newcomb and Peter Harding during the author’s 37 years of academic and industrial experience while interacting with experts from the braking industry. The heart of a braking system is the friction couple that should provide reliable, durable and consistent friction force under the most arduous conditions of mechanical and thermal loading in the operating environment. The foundation brake which is usually the wheel brake rotor/stator unit (automotive disc brake or drum brake) should be able to dissipate heat generated to the environment as fast as it can. Ventilated brake discs and sliding calipers are outcome of this requirement. Accurate control of braking systems and components using electronics and software engineering has improved road safety to a higher level. Aerodynamically designed air brakes have proved to be effective in taking some of the duty of friction brakes at high speeds. The braking system of any road vehicle is subject to legislative standards and requirements of the region of the world, the vehicle is supposed to operate. The book uses European Union Legislation and compares them wherever required with the US legislation. Brake related noise, vibration and judders are also of concern while designing a brake system. The book also discusses advance technological developments in areas like antilock braking (ABS), Electronic Brake Distribution (EBD), Electronic Stability Control (ESC), autonomous braking and regenerative braking for road vehicles. Modern dual circuit brake systems are significantly less likely to fail than the drum braking system, often found on older vehicles. The introduction of antilock brakes has helped to prevent the wheels from locking up if the driver has to brake hard. The book also provides some case studies to illustrate the experimental verification of braking system design and informs a reader on how and why the actual performance may vary from the designed parameters.